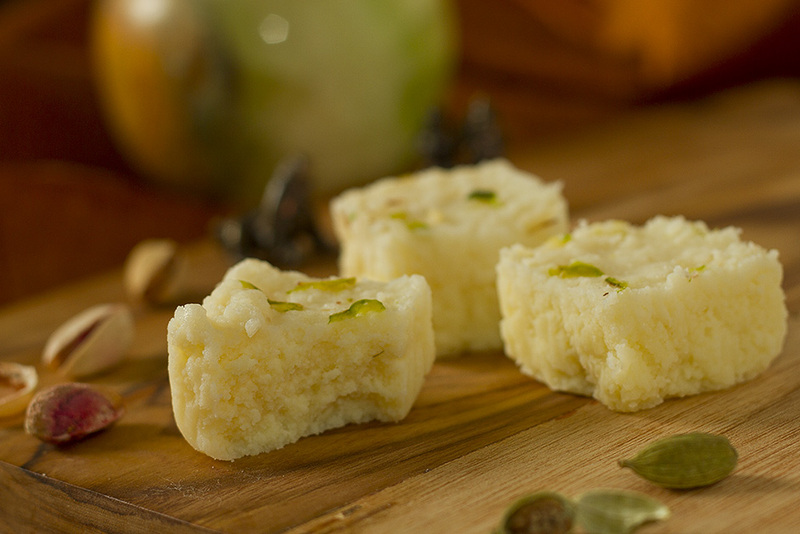 Kalakand is traditionally made from curdling the milk on the stovetop, reducing more milk and adding to it, adding sugar to it and reducing it further. But I love recipes that save time and taste just as good. So instead of Boiling the milk and curdling and reducing the milk, I used readymade paneer and sweetened condensed milk. The result was soft and delicious Kalakand in minutes. Try it, I am sure you’ll love it too. Crumble paneer to a not very fine powder. Mix milk powder to crumbled paneer. Keep a heavy bottomed pan on the stovetop and heat the condensed milk on very low flame. Add paneer and milk powder mixture to the pan containing warm condensed milk and mix well. Add Cardamom powder and half of Pistachio slivers. Keep stirring. Soon the mixture will become thick and will start leaving the sides of the pan. Remove it on a butter paper or a parchment paper. Spread it evenly in a foil lined deep dish. The layer of the mixture should be about 3/4 inch thick. Use a ring or square made out of kitchen foil to contain the spread if you feel so. Garnish it with the remaining Pistachio slivers. Let it cool completely (keep it in the fridge for some time if you want). Take a knife and cut squares.